Marshall Point Lighthouse at sunset. Captain William Wincapaw, the original “Flying Santa.” Photo courtesy Jeremy D’Entremont for the Wincapaw family. 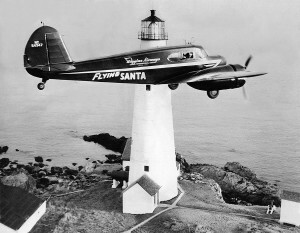 The New England tradition of a “Flying Santa” delivering gifts to lonely and often isolated lighthouse keepers and their families started 89 years ago in 1929, when a mid-coast Maine pilot, Captain William Wincapaw, started delivering gifts for his lighthouse keeper friends in Penobscot Bay, out of his hometown of Friendship, Maine. He was often directly involved in saving lives of islanders of Penobscot Bay and would help transport those sick or injured to safety or to nearby hospitals even in inclement weather. In those days, he navigated the region using the lighthouse beacons all along the coastline and was always appreciative of the lighthouse keepers’ dedication to their duties in maintaining the lights, as they were appreciative of the Captain for his rescue efforts. 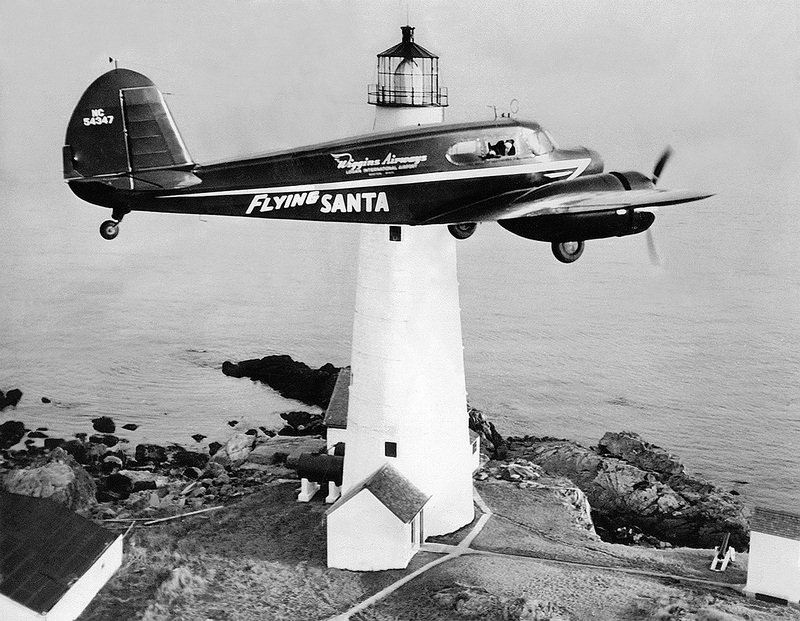 Wincapaw decided in 1929, that on Christmas morning, he would load up his plane with a dozen packages of newspapers, magazines, coffee, candy and other small luxuries for his isolated lighthouse families and friends in the Rockland region of Maine, and drop them off to show his appreciation of their heroism and efforts throughout the year. He wanted them to be remembered especially during the lonely holiday season. Word got around rather quickly of this saintly gesture and he was so surprised of the outpouring of thanks from the keepers and the locals that he decided to make it an annual tradition, increasing his range to additional stations all along the New England coast, and beyond. Lighthouse historian Edward Rowe Snow, who accompanied Wincapaw seven years later, also helped to deliver along additional routes. The two became very close friends. On July 16, 1947, as Captain Wincapaw was taking off from Rockland harbor with a passenger Robert Muckenhirn, he suffered a heart attack in the air and the plane crashed in the ocean, killing both men. Many keepers, their families, islanders, and locals from all over New England attended his service in observance of their gratitude for his services. That December, Snow would drop a memorial wreath in Rockland Harbor in honor of his close friend. 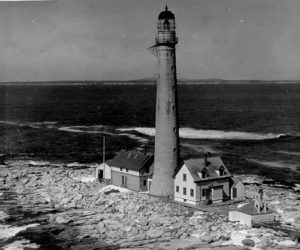 After the death of Captain Wincapaw, historian Edward Rowe Snow continued to carry on the now famous tradition of delivering Christmas bundles to stations all along the New England coast and expanded the delivery to 176 lighthouses in 1947. 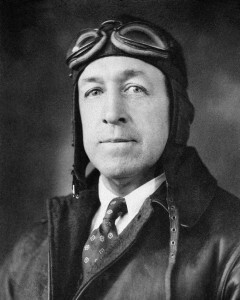 Over the years, during many of the flights he would still hire a pilot out of his own pay, and he and his wife would enjoy the satisfaction of their efforts as repayment. 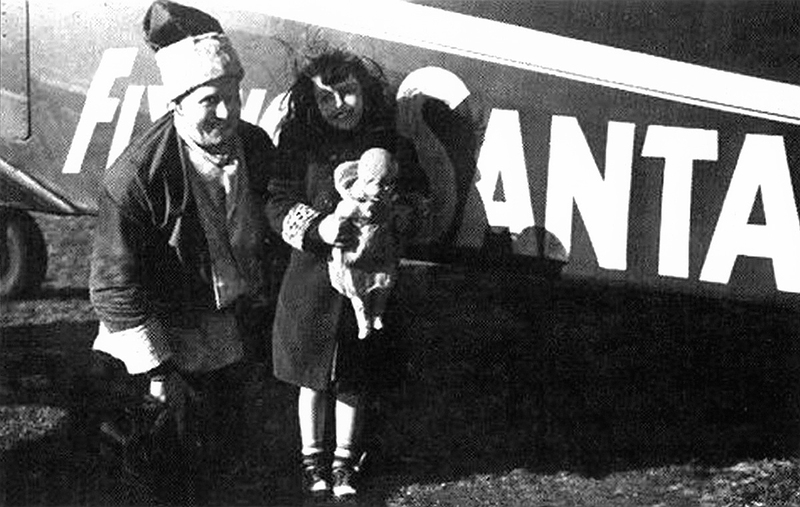 They had a daughter who would also accompany them on their flights as part of the family tradition. Wiggins Airways also helped in providing planes, and later helicopters, and occasionally provided pilots to help the Snows. On a few excursions, the Coast Guard would provide Snow with one of their own aircraft to help him with his expanding deliveries. 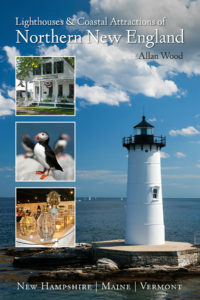 Packages would continue to be provided by the many sponsors, and Snow began to write books about New England stories and lighthouses, which he would also provide for the keepers and their families. Snow flying over Boston Lighthouse (1947). Photo courtesy Jeremy D’Entremont for Dolly Snow Bicknell. As there were rare occasions of a risk of a package missing its target and destroying property, Snow still had to carry rather expensive insurance for his endeavors. Although the 15-25 pound packages would usually land on their target, there were some instances were some property was destroyed and the insurance would cover the mishap, with most of the “victims” recalling the experience to their families in a humorous manner. On many flights, as he would open the window to drop the gifts in his Santa costume, his fake whiskers would be blown off his face with the fierce winds. 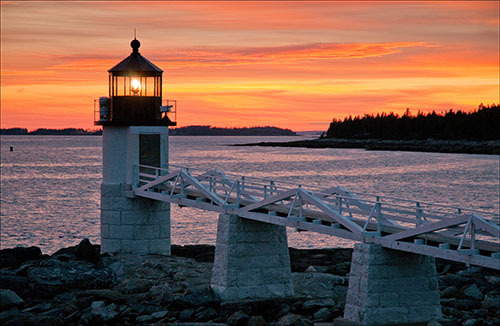 During one of his drops they had quite a scare when two packages tied to a rope lodged themselves around the tail of the airplane near Boon Island Lighthouse in York, Maine. They were able to safely make an emergency landing safely at nearby Portsmouth, New Hampshire. In 1953, Snow decided to fly a transcontinental Santa flight that would not only include New England stations, but also stations in California and Oregon. In 1954 he expanded his flights to include Bermuda, the Great Lakes, and a remote location known as Sable Island about 100 miles from Nova Scotia. He arrived near the destination by seaplane, and then took a horse drawn wagon to the lighthouse where he presented gifts to 3 children and 23 grateful adults on the tiny remote island. In the 1970’s, Snow also chartered boats to help with his tasks. In 1974, with much inclement weather, only some of the gifts could be distributed, and many trips had to be cancelled, as many airports were snowbound. This hadn’t happened since the war era of the 1940’s. During the 1970’s air space was very restricted with increasing FAA regulations and Snow found himself using a helicopter to deliver the bundles, as he had done once many years before in 1946 to deliver an unbroken doll to the keeper’s daughter, Seaborn Ponsart, on Martha’s Vineyard. The children and their families enjoyed the new spectacle as many times the helicopter would come very close or could land nearby. By 1981, Snow was getting along in years and suffered a stroke, which was going to prevent him from dropping off any bundles that year. Judeth Van Hamm, director of the Hull Lifesaving Museum, approached Snow’s wife to offer any assistance. With the blessing of Ana-Myrle Snow, and with a limited budget and time to coordinate the undertaking, the museum was able to acquire the service of three helicopters from a local Boston television station, Wheelabrator-Frye of Maine, and the International Fund of Animal Welfare of Yarmouthport, Massachusetts. A new Santa, Ed McCabe, offered his services to carry on the tradition. Although the numbers of flights were limited compared to previous years, and as many lighthouses were automated, it was greatly appreciated by those lucky recipients of the gifts. On April 12, 1982, Snow passed away at the age of 79. 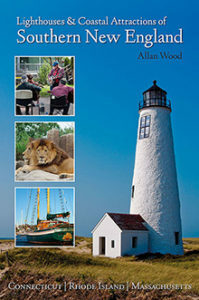 He had written over 90 books on maritime history from shipwrecks, to pirates, to lighthouse stories, and remained as one of the Flying Santa’s for nearly 44 years. He is also remembered as the driving force in saving Fort Warren, a famous Civil War fort on George’s Island in Boston Harbor, to be maintained as a public park for all to enjoy and remember the efforts of those veterans who fought in that war. In 2000, a granite marker was placed at the pavilion as a memorial to Snow for visitors on George’s Island. It reads “Author, Historian, and ‘Flying Santa’. His efforts and writings about New England’s history and folklore remain in the hearts of all who have been touched by the limitless generosity to his fellow friends. The Hull Lifesaving Museum in Massachusetts answered the call and continued the tradition of the Flying Santas. As years passed, other good Samaritans would follow Snow’s path and become Flying Santas, helping to increase the number of flights. 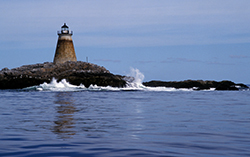 Although the stops would be brief, they would try to manage extra flights to additional lighthouses when at all possible. More local and corporate sponsors would provide gifts for the children to help with the efforts. In the late 1980’s, local Boston news station WCVB-TV 5 would help out the museum by providing a helicopter and much needed public exposure. It is still involved with the Flying Santa events in Massachusetts today. 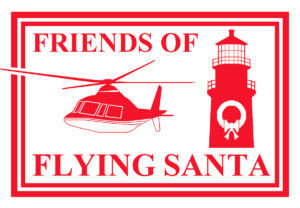 By 1997, the Flying Santa program was transferred from the Hull Lifesaving Museum to a non-profit group of volunteers calling themselves the Friends of Flying Santa. This non-profit organization would help to ensure a stable financial future in keeping the program alive, and developed the official red logo to help with fundraising efforts on clothing and novelty items. The program continues today as a gesture of appreciation to the dedicated Coast Guard crews and their families. 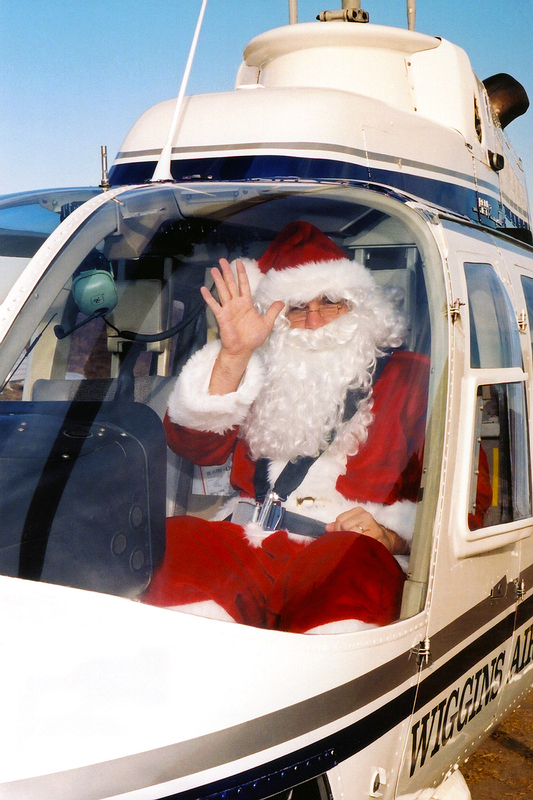 Now flying by helicopter, Santa’s route includes over 30 stops from Maine to New York. Their Web site at www.flyingsanta.com keeps the public informed of events and helps in their efforts to raise funds for this wonderful program. All money raised by this campaign goes directly to purchase gifts for the children. There are no paid staff or administrative fees. 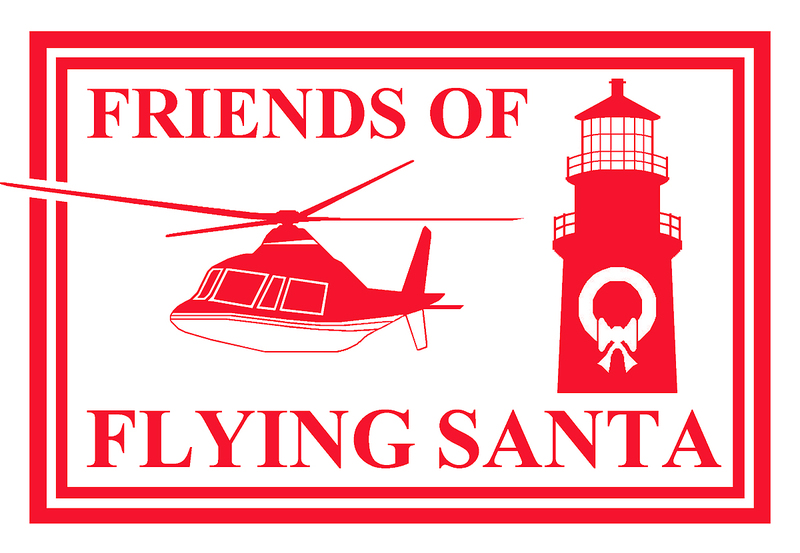 If you want to help, or want to learn more about the organization, or upcoming events year-round, visit the Friends of Flying Santa website. Flying Santa Tom Guthlein. Photo courtesy of Brian Tague. 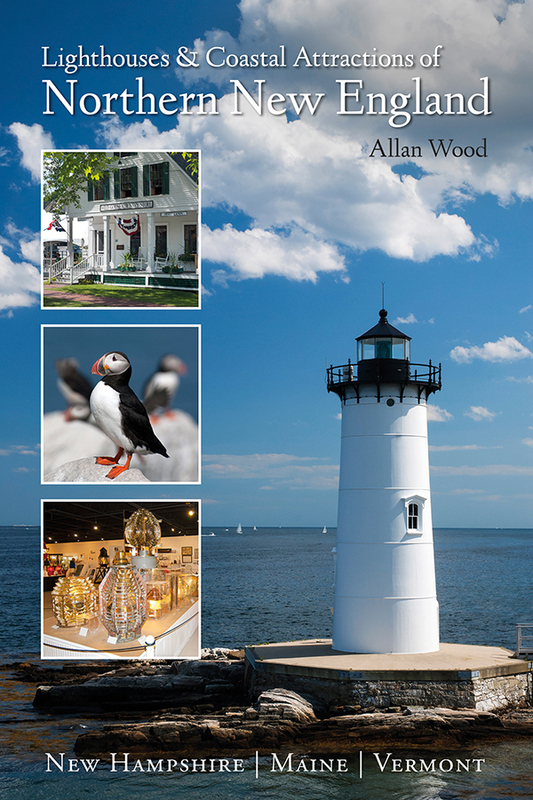 Nowadays, it is an event where many of the lighthouses chosen, and are many of the same lighthouses Captain Wincapaw and Edward Snow had flown over to deliver gifts from almost 90 years ago. Many sponsors continue to donate gifts to help with continuing this annual tradition. Since 1996, Chief Warrant Officer David Waldrip, USCG, and Chief Warrant Officer Tom Guthlein, USCG, have become the current Flying Santas. Pilots who have helped with the flights for the flying Santas include Tom Clegg, Paul Ellis, Tony Liss, George Louzek, Art Godjikian, LaRay Todd, Leo Boucher, Greg Harville, and many others. Today, the Flying Santa comes down in a helicopter and calls out the name of children in attendance and presents them with a little gift to continue the annual tradition. It’s an exciting experience enjoyed by adults and children alike. 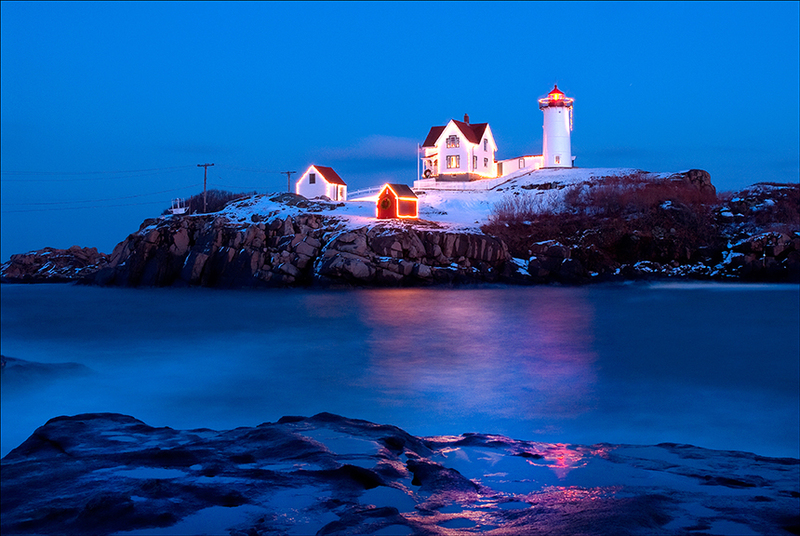 This annual event is promoted and scheduled to remind people of the many personnel that came before to tend the lights, and for the Flying Santa’s that made the process a part of their lives to help those lighthouse and Coast Guard families in need of Christmas cheer. The events are used today as a simple expression of gratitude for the work performed by the Coast Guard. Next year, in 2019, celebrates the 90th anniversary of this wonderful organization, and of the generosity of special people, remembering those that guided our lighthouses, and those in need. Have a wonderful and safe holiday season, and spread the gift of generosity. 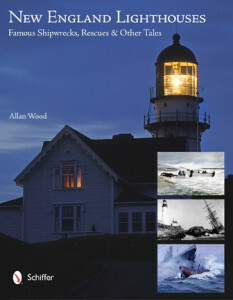 You’ll find this story and many others in my book New England Lighthouses: Famous Shipwrecks, Rescues, and Other Tales. The book also contains, along with my photographs, vintage images provided by the Coast Guard and various organizations, and paintings by six famous artists of the Coast Guard.